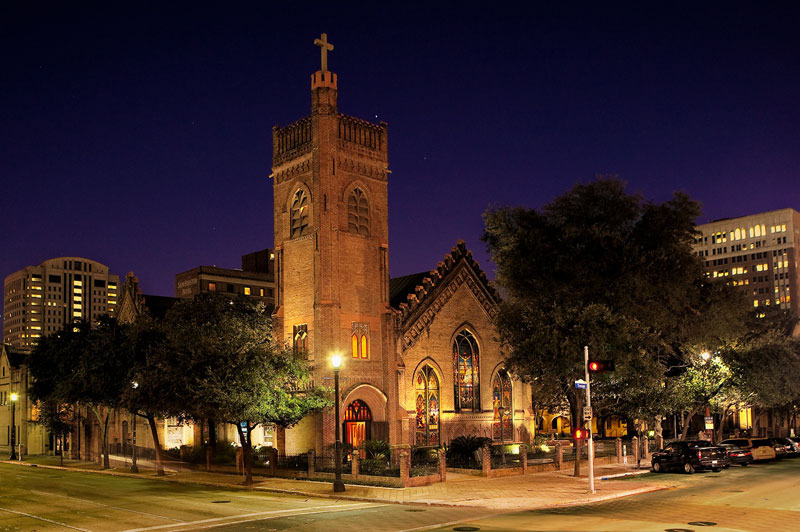 Arguably the longest worshiping congregation in downtown Houston, Christ Episcopal Church has been an integral part of the city for over 175 years. Founded on March 16, 1839, it is considered to be the first Christian congregation in the city. Christ Episcopal Church has been continuously meeting at the site of its current location since 1845 when the first church building was completed. The congregation outgrew the first building in a decade and began constructing an addition on the property in 1859. This new building took over 15 years to complete due to the Civil War. By the time the second church was completed, the congregation was again too big for it. 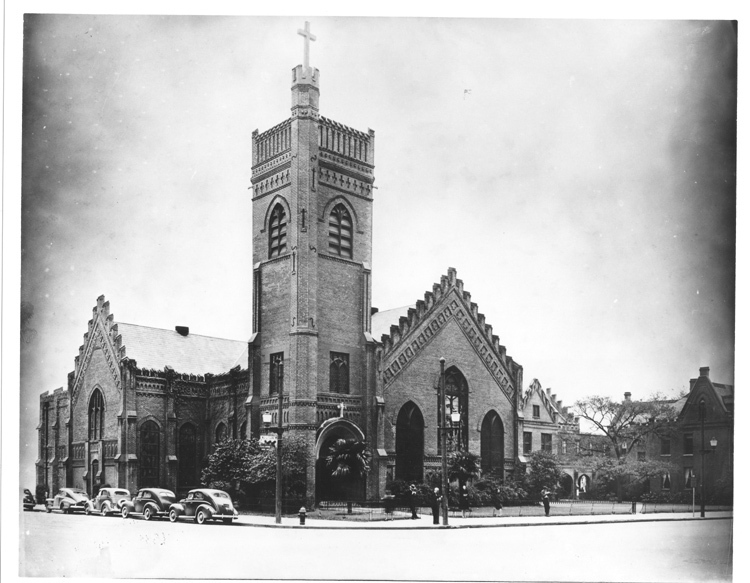 After its consecration in 1876, Christ Episcopal Church immediately began work on expanding the new building. They began to add a cloister adjacent to the main building, hoping to connect the two. During the connecting phase of the expansion, part of the main building collapsed and much of the structure had to be torn down. The congregation, without hesitation, chose to rebuild. Several features of the second building were moved into the current cathedral, including several stained glass windows and the carved rood screen (partition between the chancel and nave), all of which can still be seen today. In 1938 a fire in the chancel brought down the roof. The rood screen was saved by a firefighter who went into the building and doused it with water. The entire city of Houston rallied to help the church raise the money to fix the damages. In 1949 Christ Episcopal Church became the cathedral seat of the diocese of Texas and now houses the offices of the Bishop of Texas. It continues to be a thriving congregation and hosts six services every Sunday, including one Spanish service. The services are open to everyone, regardless of denomination. The church leads many community outreach programs designed to help the residents of inner city Houston. It is also home to a large preschool. The city of Houston and Christ Episcopal Church have a long and shared history and continue to influence each other. 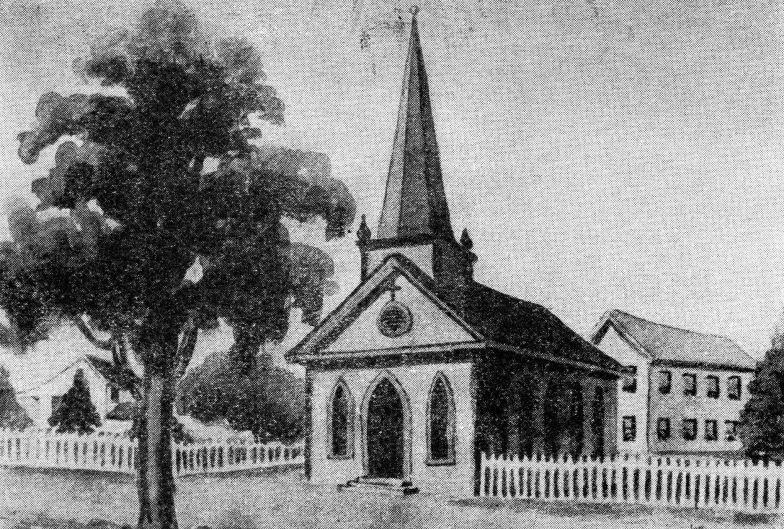 Original Church 1847: Drawing of the original building for Christ Episcopal Church, completed in 1847 ~ Source: Turner, Allen. "Christ Church Cathedral's Story Parallels Houston's." Houston Chronicle, March 15, 2014. Second Building ca. 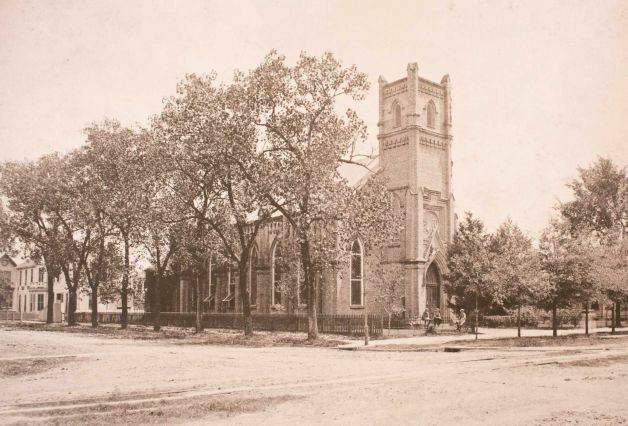 1876: Photo of Christ Church Cathedral's second building ca. 1876, prior to its collapse in 1893. ~ Source: Turner, Allen. "Christ Church Cathedral's Story Parallels Houston's." Houston Chronicle, March 15, 2014. Christ Church Cathedral 1945: Photograph of Christ Church Cathedral four years before its consecration as seat of the Texas diocese. ~ Source: Turner, Allen. "Christ Church Cathedral's Story Parallels Houston's." Houston Chronicle, March 15, 2014. Nave After Fire, 1938: Picture of the nave after 1938 fire. Central in the image is the carved rood screen that was saved by a Houston firefighter. ~ Source: Turner, Allen. "Christ Church Cathedral's Story Parallels Houston's." Houston Chronicle, March 15, 2014. Close-up of Carved Rood Screen. 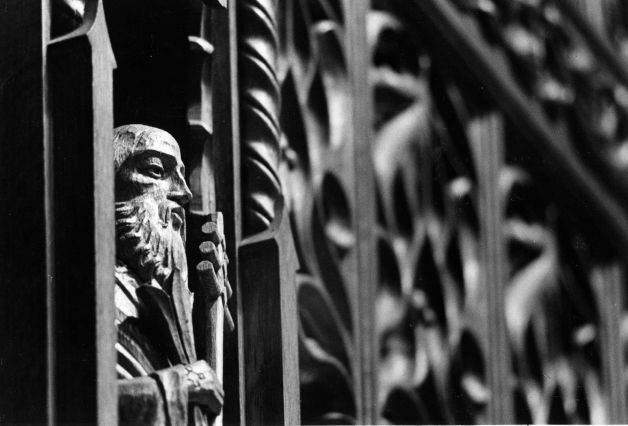 : Close-up image of figure on carved rood screen in current building. 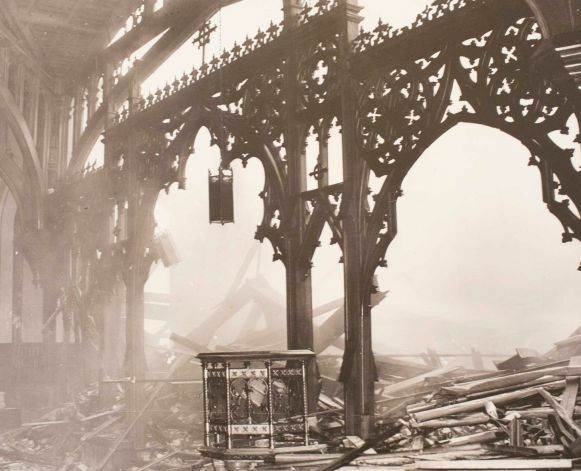 The rood screen survived the 1938 fire with only slight charring. ~ Source: Turner, Allen. "Christ Church Cathedral's Story Parallels Houston's." Houston Chronicle, March 15, 2014. 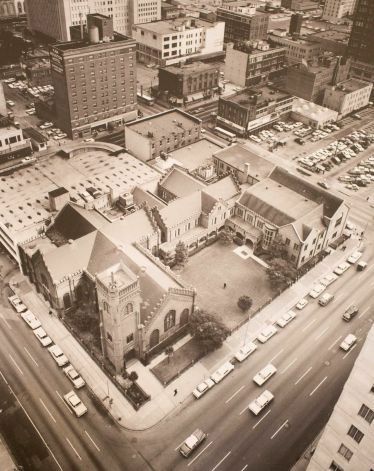 Aerial Photo of Cathedral Complex: This is an aerial shot of the entire Cathedral complex in 1960. The complex includes the offices of the Bishop of Texas, several community outreach programs, a bookstore, restaurant, and school. ~ Source: Turner, Allen. "Christ Church Cathedral's Story Parallels Houston's." Houston Chronicle, March 15, 2014. Grant Schreiber, “Christ Church Cathedral,” East Texas History, accessed April 21, 2019, https://easttexashistory.org/items/show/55. "History - Christ Church Cathedral." Christ Church Cathedral.